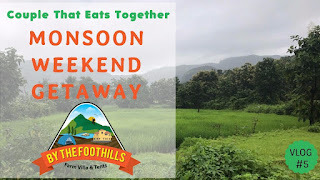 Hey guys we are back with another vlog from our weekend at a resort near Khopoli “By the Foothills”. The place is around 113 kms from Mumbai about 3-4 hrs drive. It is aroudn 25kms famous amusement park adlabas Imagica & AquaImagica. It is a scenic drive during monsoon. The place has poor network coverage so better save map / route offline on google to reach or follow the road signs placed at regular distance to reach the resort. The resort is by the foothills of Fort Mrugagad. The trek to Mrugagad will be arranged by resort and it is around 2.5hrs medium difficulty trek. The place is just for relaxation and unwind from daily routine. 1. Apple iPhone 7 2. Please watch: "Italian Cheese Grilled Pani Puri | PIZZA PUNCH | Amazing Street Food #couplethateatstogether"